It seemed like such an ordinary week, really. My days have become a long stream of endless tasks: cleaning out closets, sorting items to give away, sell or keep. When not doing that, I'm pawing through papers, letters, and financial documents - attempting to cull the important from just plain trash. Thursday offers a slight break in the programming. Thursday noon, two things happen…… Pie Day - the weekly event held at a local bakery, Lori's Creative Cakes, where women gather for whatever pie the staff has baked for the day. I say women - men can come but it is rare to find one there. Their loss. Now, Lori is known throughout the area for her beautifully decorated cakes and cookies. She has won numerous regional and even national cake decorating contests and many are on display in her shop. Most disturbing is a nearly life-sized boxer, laying on a rug. No matter where you sit in the room, that dog's eyes follow you - it is unnerving, considering he's frosting and pastry. The real reason for Pie Day, though, is an official time for sharing news and intellectual conversation. For instance, I learned last week that Long John Silvers in the neighboring town went out of business a couple years ago, leaving the people of the county strapped for fried fish and, well, scraps. Crisps? Those little hunks of friend batter that fall off the fish and have no apparent use. Seems that if you ask nicely Long Johns will serve you up a passel of those fried thingies - give em to you for taking them off their hands. Now, THAT is news! The other thing that happens on Thursday at about the same time as Pie Day is the delivery of the local paper. When I was growing up, my dad ran one of the two papers in town - The Democrat. That's a story for another day, but the paper can be another good source of small town information. In the old days, family members loved to come visit us because they always had their names listed in the paper. "Bob and Janet's nieces came for dinner on Sunday. After chicken and rice casserole they took a walk to the Riverside Park." I'm not kidding. There was someone assigned to call the little old ladies in town to see who visited them during the past week and it all got served to the readers in black and white. This week's paper was a keeper! Under the photos of smiling kids with their Easter candy (provided by the local hospital - which I find somehow sinister) is an article on a blue shaded background with big red letters proclaiming "NO MORE B-S IN OSWEGO CITY HALL!" Heck, I saw people buying this paper just for that article. Seems someone noticed a trend in local city government going back 44 years. Every mayor the city has had in that time has had a last name beginning with a B or an S and none of them were related. This year's running S got beat out by the running F, ending the tradition. However, if I know governments - there'll still be lots of, well, you know..... BS. But, with all this exciting news, imagine my surprise to open the paper to see a familiar name. You see, Arayo made the paper because we walked to town for Pie Day last week. I tied her to a little bench in front of the shop and she sat alone, sadly gazing into the store at all the women happily telling lies and eating pie. 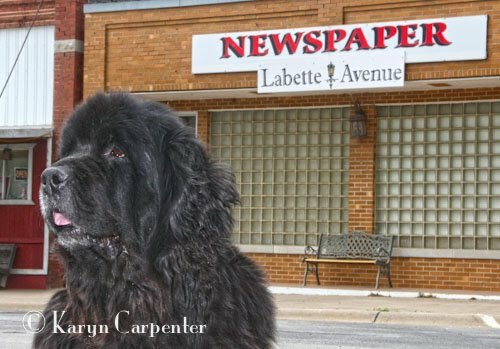 The owner, Lori, took pity on her and gave her a peanut butter cookie - all this while Rena, the editor of the paper took note. So that was Arayo's break into the local news. She attended Pie Day where she was treated to a cookie! Can't get more exciting than that! I've been to Pie Day, too! Lots of fun! Also, as a girl, I loved getting my name in the Oswego Democrat: "Kayrn Carpenter's cousin, Ann, came to visit for the weekend. The two girls played with their Barbies and went swimming." "We love Arayo. She came for a visit yesterday and we are always glad to be graced with her presence. Great blog Karyn!" Karyn, we at Labette Avenue consider you and Arayo to be hometown celebrities. When you come back home to visit, you always bring the buoyancy that we in in the prairie states sometimes miss. Come often. Stay full-time if you wish. *giggles* Love the recounting of a typical, exciting day back home. Sounds like times change...but not really. I love this post, Karyn! You have perfectly captured the sould and essence of the small town. Love you and Arayo, and I hope they gave you a cookie, too!